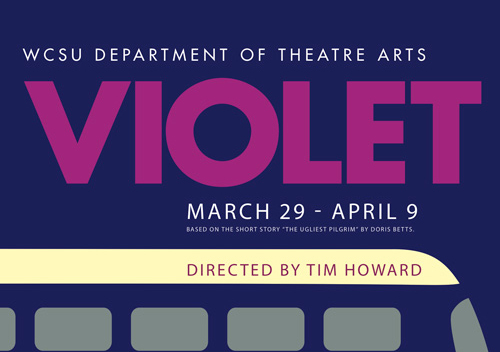 The WCSU Department of Theatre Arts will present “Violet” in the Studio Theatre of the Visual and Performing Arts Center on the University’s Westside campus, 43 Lake Ave. Extension in Danbury. Performances will be at 8 p.m. on March 31, April 1, 7 and 8; with 2 p.m. matinees on April 1, 2, 8 and 9. Set in the midst of the Civil Rights Movement, this awe-inspiring musical explores the true meaning of beauty and the courage of a young girl who embarks on a journey of self-discovery during one of the most turbulent times in American history. Directed by Tim Howard. To purchase tickets, visit www.eventbrite.com/o/visual-and-performing-arts-center-at-western-connecticut-state-university-6275173871 or call (203) 837-8732. For a complete list of similar SVPA events, visit www.wcsu.edu/svpa/events.asp.